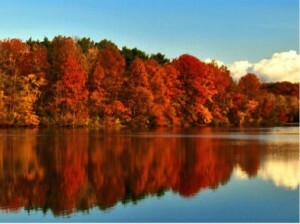 A drought-shortened color season may blunt the impact of Great Lakes fall tourism. Stress induced by the dry summer may have leaves starting to fall a week or so earlier than normal, said Bert Cregg, a professor at Michigan State Universityâ€™s Department of Forestry. â€œI would say this past week and the weekend coming up are going to be the peak [in color],â€� he said referring to Michigan.